From cooking shortcuts to packing pointers, clever advice for getting to January 2 with your good spirits intact. North Korea. Fake news. Global climate change. The 24-hour news cycle just won’t quit, and . . . wait, what? It’s already time for holiday cheer? With so many tasks to accomplish, the last month of the year can be exhausting. So we asked an all-star team of local experts — chefs, a professional organizer, a family therapist, and more — for their best advice for sliding into 2018 with your wallet, family ties, and good humor intact. “A slow cooker is your shortcut best friend,” says Holly Joe, an interior designer and former caterer from Westwood. Joe uses hers to make short ribs with polenta and chicken in white wine when entertaining at home. Gilson recommends one for making gravy, spiced cider, and mulled wine ahead of a party. Spatchcocking (butterflying) a turkey reduces cooking time and yields “a super-crispy, brown skin,” says Gilson. He prefers fresh birds to frozen varieties and warns that if your turkey-cicle is not defrosted in time, you’ll be in trouble. 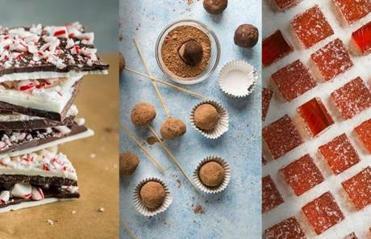 From chocolate truffles to popcorn, whether a hostess gift or a reward for yourself, holiday treats can help spread joy. Joe keeps a log of sugar cookie dough in the freezer for last-minute entertaining. Forget the rolling pin and cookie cutters — just coat the log in sugar, slice, and bake. She also stocks up on seltzer, wine, snacks, and chocolates in case anyone pops by. Plan on five to six drinks per guest, says mixologist Willa Van Nostrand, owner of Little Bitte Artisanal Cocktails, a caterer in Providence. Her standard calculations allow for two cocktails, two glasses of wine, and two beers for each guest, even though most people stop at three or four drinks total. To do the math, note that a 750-milliliter bottle of liquor yields 12 drinks and a case of wine equals 48 glasses. Bubbles say “festive,” and you don’t have to spend a bundle to get a decent sparkler. “A good bottle of dry cava or prosecco can really do the trick,” says Van Nostrand. Focus on choosing something dry, and expect to pay $12 to $16. Reservations for eight or more can fill up quickly, especially if you want a private dining room, says Alexander Sprague, private events manager at Boston Chops in the South End. If you need space for a large party and it’s already December, aim for a Monday or Tuesday, which tend to be less busy than the rest of the week. Always ask about a venue’s cancellation policy, advises Susan Earabino, private events manager for Harvest in Cambridge and Grill 23 and Post 390 in Boston. And if you want to bring in your own decorations, check ahead — not every place permits it. Planning for a gift exchange? Make sure your reservation allows enough time. Before you light up anything, pare down. “Let go of burned-out twinkly lights, chipped or cracked ornaments, or damaged decorations,” says Stasia Steele, owner of The Little Details, a professional organizing service in the Back Bay. Once you’ve taken stock, assess what you need, then get to work. Interior designer Joe loves to decorate with natural greens, pine cones, and branches. Place them in clear vases and lanterns and on mantels, consoles, countertops, and even bookcases. Double-faced satin ribbon and metallic ornaments can also dress up a space without much fuss. Use battery-operated lights and flameless candles on timers, which are safer than open flames and save time. If decorating fills you with dread, consider turning to a pro. Steele’s team will trim the tree, hang lights, create table settings, and organize it all before packing it for storage. “We’ll follow your family traditions or make new ones,” says Steele. What would the holidays be like without a battle with the string lights? For $380 for a four-hour session, you can find out. At the end of the season, sort your decorations by category — indoor, outdoor, tabletop, and so on — and store them in one area of your house “so you can easily find them,” says Steele. She likes Sterilite bins (which come in Halloween, Thanksgiving, Christmas, and Hanukkah colors) and spools to hold string lights. “If the host is on the casual side, honor that,” says Snezana Pejic, founder of the Etiquette Academy of New England. For fancier friends, step up your game. But for professional events, she says, “always dress up. Business formal.” For men, that means a suit and tie; for women, a suit or dress. For women, Greeley loves Target’s Sugarfix by BaubleBar and Who What Wear collections as well as T.J.Maxx for inexpensive but festive attire. Add some metallic mules or a tulle skirt to your wardrobe, for example, then mix and match. “Buy in pieces and look for outfits rather than buying a dress,” says Greeley. Guys can search Pinterest for holiday outfits and unexpected ways to create a festive look from clothes they already have in their closets, she says. To branch out, hit up off-price shops like Nordstrom Rack and Saks Off Fifth as well as outlet malls. Paper cards aren’t a necessity, says Pejic. For e-cards, Paperless Post has wonderful designs (free to 30 cents per “card”). If you take the snail mail route, Minted and Shutterfly’s Tiny Prints line are contemporary faves for personalized (and, yes, more expensive, at roughly $1.25 to $3 per card) paper greetings; both services will address envelopes for you and can rush them into your hands in as little as two days. CVS will produce less expensive photo cards in under 24 hours. “Even sending out an e-mail is fine,” Pejic emphasizes. It really is the thought that counts. For formal or corporate events, if there’s a meal, says Pejic, it’s fine to head for the door 30 minutes after dessert ends. For casual affairs, take cues from the hosts. “If they seem tired or start to yawn, if they start talking about their plans for tomorrow or looking at their watches, it’s a clue,” says Pejic. “Unless you’re there to help clean up, don’t linger.” And always say goodbye to your hosts. Pejic coaches introverted clients to brush up on the news and prepare conversation starters. Or ask about a person’s family or work, information most people love to share. “And never answer just with ‘good’ or ‘great,’ ” she says. People need more than that to keep a conversation going. “Hand them a glass of sparkling water and ask them to hang out for a while,” says caterer Van Nostrand. Then use Uber, Lyft, or a taxi service to get them home. Planning ahead and staying within a budget are always good ideas, and mobile productivity apps make smart shopping even easier. They allow you to track spending, people, and even what you’ve wrapped. Steele recommends Gifted, GiftPlanner, and Santa’s Bag for iOS. An Android option is Gift List Manager. Inject some me time into your holiday chores — and support local vendors and artisans , to boot. Head to boutiques in the burbs or holiday craft shows, such as the SoWa Winter Festival (December 2 and 3) and CraftBoston Holiday (December 15 to 17). “Bring your friends, grab a coffee, and pick up something you wouldn’t see at the mall,” says stylist Greeley. Wrapping presents can be tedious, so it helps to have a designated space for the task, says Steele, who recommends using a rolling Elfa cart or an organizer tote, both available at The Container Store. Need paper in bulk? Greeley suggests T.J. Maxx, HomeGoods, and Marshalls, which have quality styles at affordable prices. Really hate this job? Many shops will gift-wrap for you, so always ask. You can also hire an organizer like Steele or try a service like TaskRabbit. “It’s always good to bring something,” says Pejic. A bottle of wine, box of chocolates, candle, or bouquet (in a vase, to save your host some trouble) will be appreciated. Don’t assume the host wants you to bring cooked food, though; it might conflict with the menu. “Tipping is a beautiful tradition,” says Pejic. For people like crossing guards and hairdressers, $35 to $50 is usually appropriate. But do what fits your budget. If cash doesn’t feel right — say, for a teacher — gift cards can be appropriate. A small gesture will always be appreciated. The Transportation Security Administration allows wrapped gifts in carry-on and checked luggage, but they’re subject to search and must follow rules about banned objects. If possible, wait to wrap till you arrive or ship gifts ahead of time. And consider this: If the airline loses your luggage, good luck. But shipping services like FedEx and UPS let you track and insure your packages. Irregular schedules and too many sweets can transform cute kiddos into holiday monsters. “The trick becomes maintaining important routines, even if the setting changes,” says therapist Jeremiah Gibson, president-elect of the Massachusetts Association for Marriage and Family Therapy. “Don’t change the way that you discipline your kids,” he says. And communicate boundaries to extended family members if you’re away from home. 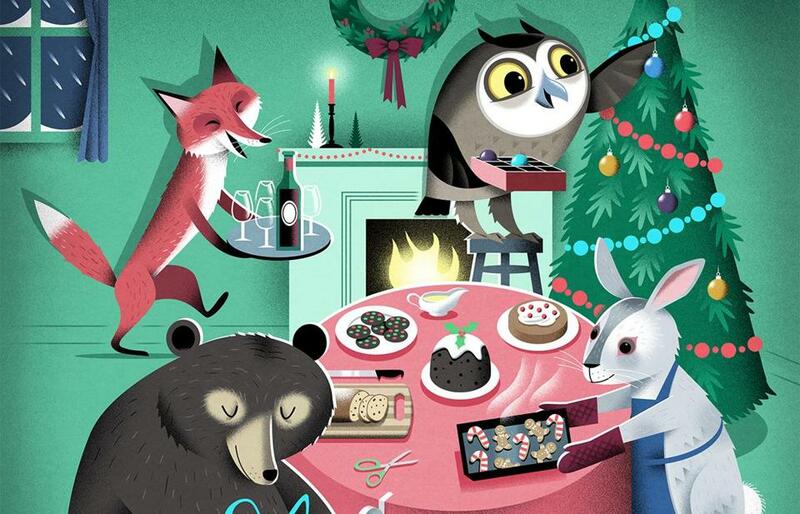 Gibson asks clients to consider what holiday traditions make their families unique. His goes caroling with friends, for example, but crafting, volunteering, or cooking could make your nuclear unit shine. “Families that focus on the process of experiences rather than the end result of gift receiving seem to have less anxious holiday seasons,” he says. “One of the challenges that blended and multicultural families commonly face is the either-or perspective,” says Gibson. “It’s either your family’s way or my family’s way.” Instead, he says, find places where traditions — whether ethnic or religious — can intersect, then honor them. “Some conflict is unavoidable,” says Gibson, so be like the Buddha, and prepare for some amount of suffering: Certain topics or circumstances will create friction. “Accept your family for who they are, and know that it’s not your job to change your family’s perspective if they, say, voted for a different presidential candidate than you did.” Knowing is half the battle, anyway. Just take a deep breath, and resist the urge to engage. The number-one thing you can do to stay well is to be up to date on all of your vaccinations, not just the flu shot, says Dr. Al DeMaria, medical director of the Bureau of Infectious Diseases and Laboratory Sciences at the Massachusetts Department of Public Health. This is the best way to protect yourself — and people with compromised immune systems — against preventable diseases like shingles and whooping cough. If you’re traveling with kids, consult your pediatrician; she may recommend a vaccination ahead of schedule. “You can’t overestimate the importance of hand washing and basic hygiene,” says DeMaria, who notes that alcohol-based hand sanitizers are effective, too. Actions like fist bumping instead of hand shaking aren’t proven to reduce the spread of germs, but consider measures such as using your own pen to sign receipts, wiping down your cellphone, and avoiding public railings and other germy surfaces. It’s critical to avoid touching your face and eyes after contamination, DeMaria says. To prevent a pigout, eat something high in protein before you head to a party, says Blair Flynn, a yoga teacher and wellness blogger in Boston. Flynn also suggests packing breakfast and lunch to bring to work on the day of the party, which will help you stay in control and avoid extra calories and temptation. Setting out exercise clothes at night or making a workout date with a friend can help you maintain your commitment to the gym, says Flynn. “If it’s already in my mindset that I’m going to go to that 6 a.m. class, then I make better choices the day before.” On the other hand, she says, “sometimes sleeping in is the better choice.” Just don’t make excuses. “If you really want to stay healthy during the holidays, keep your drinking in moderation,” says DeMaria. Flynn’s trick? “After a few drinks, take a five-minute breather to reevaluate how you feel.” Then decide whether you’re better off staying out or heading home. Self-care often takes a back seat when life gets busy, so make time for mental relaxation, even if it’s quick. Read a book, take a bath, skip an event (after notifying the host), or have coffee with a friend. Watch the “treat yo self” episode of Parks and Recreation (“Pawnee Rangers,” season 4, episode 4). “When you minimize your stress, you create some extra margin of keeping your health,” says DeMaria. Meaghan O’Neill is a writer based in Newport, Rhode Island. Send comments to magazine@globe.com. Follow us on Twitter @BostonGlobeMag.